Summer is the season almost synonymous with mangoes in India and however you resolve to keep under control, you just end up having mangoes everyday. Other fruits seem just so pale when mangoes are around, I am eating my melons, peaches and plums too but as both of us love anything with mangoes I find an excuse to buy more mangoes every week. This .aam malai is a childhood favorite and mango loaf is baked for breakfast quite frequently, mango slices find their way on the dining table even in their most basic form. Mangoes are cut every day on the dining table and we make something else with them only when we have had our fill of those plain juicy slices of this wonder fruit. Sometimes I plan better and keep some sticky rice or overcooked rice ready and rustle up a quick mango sticky rice for ourselves. Long time back I had seen this dessert, actually a street food ( on discovery travel n living of course) being sold in Thailand neatly wrapped up in plantain leaves, I made it just after seeing that and now I have even adapted it for a quick version. It's so easy to make if you have coconut milk powder in your fridge. 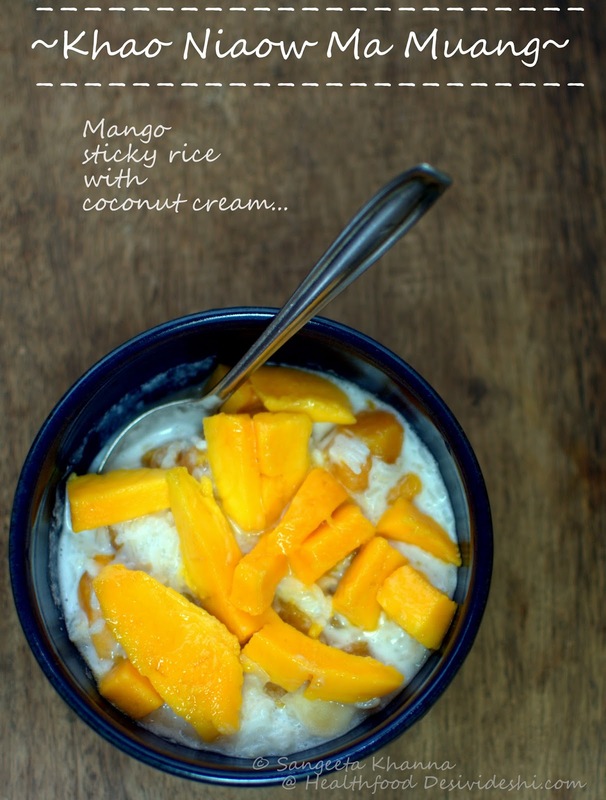 The flavors of mango and coconut milk combine so beautifully together along with some fragrant sticky rice. I use any sticky rice variety ranging from Arborio or Thai sticky rice, Black rice from Manipur, Basmati or short grain Gobindbhog (very fragrant variety) to make this. Believe me you won't be disappointed if you have cooked the rice well and have mixed it well with coconut cream. Actually as I cook quick recipes only these days due to time constraint, I am using the leftover rice for this too, I purposely make extra rice so that I can make this for ourselves whenever we feel like a mango dinner. Let's start with the recipe which is more like a quick assembly rather than a proper recipe. You just need to put everything together. Take a cup of cooked rice in a microwave safe bowl, add 1/4 cup of water and 1/4 cup of coconut milk powder OR about 3/4 cup of thick coconut milk to it and microwave it for 2 minutes. The rice should look very soft and sticky and the microwaving time can be adjusted to get the right consistency. Sometimes I make it a bit runny and sometimes it is lumpy and sticky. Cook sticky rice or any other rice variety that you intend to use for this dessert, just follow the instructions (on the packet) or go by your trusted method to cook the rice. Add a cup of coconut cream (25% fat) or coconut milk (16-20% fat) to each cup of cooked rice, mix well. 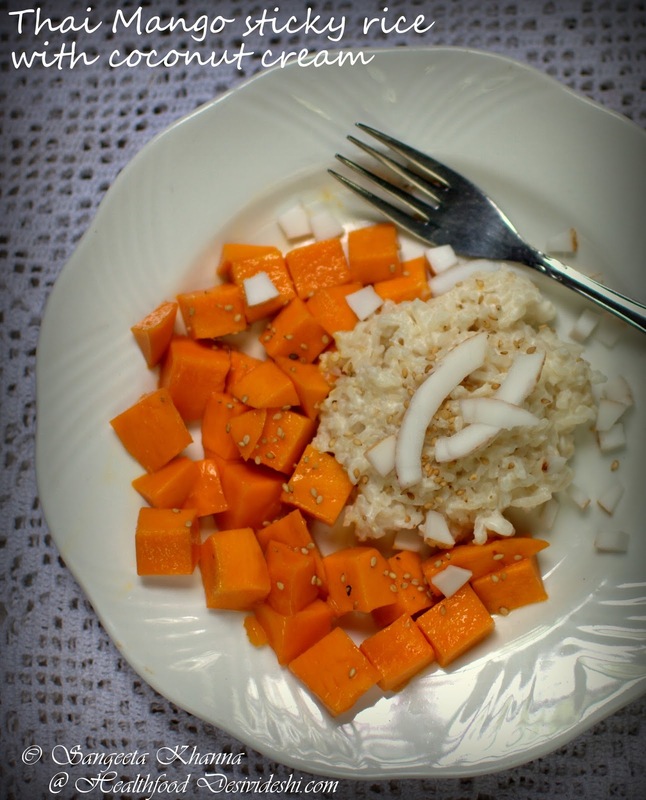 The natural sweetness of coconut will be enough to sweeten the mix, rice also has a slight sweetness of its own.Top with a cup of cubed mangoes and serve hot, warm or cold. Sprinkle toasted sesame seeds if you wish or have it as it is. You can use fresh paste of tender coconut to replace coconut cream too, that gives you more textured dessert and you get to taste real coconut with rice and mango. For that you need to cook the rice in usual amount of water and just when it is about to cook add pureed fresh coconut (equal amounts of cooked rice and coconut works best) to it and cover the pan so that the flavors seep in. 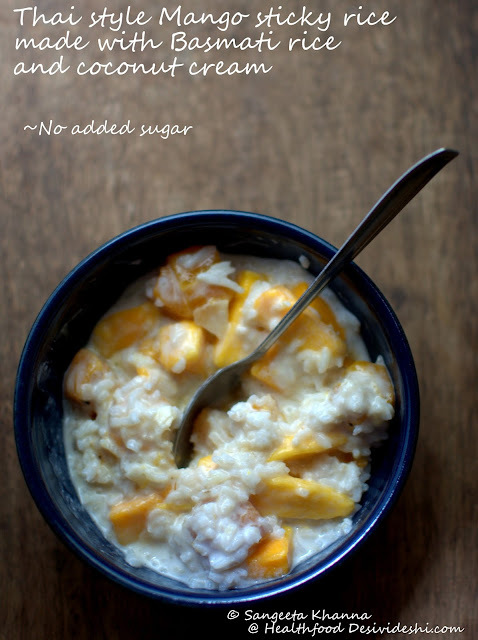 Add sugar (only if required) and top with cubes of mangoes and serve as you like. This version definitely needs planning (for coconut processing) which I am not able to do at this point of time. The quicker version is working just fine for me at this point of time, with leftover Basmati rice. Yes we mix it up like a pudding sometimes, making the rice mix a bit loose with more coconut milk. We can have it for breakfast, evening snack or dinner. Always game for some mangoes with coconut sticky rice. 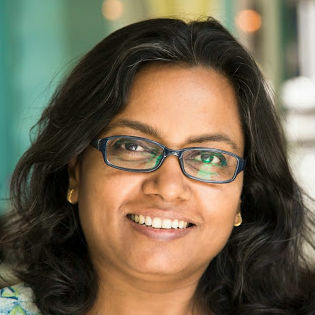 As long as there is some leftover rice, some juicy mangoes and some coconut milk in stock, you can make it in a jiffy. Have yo tried it yet? 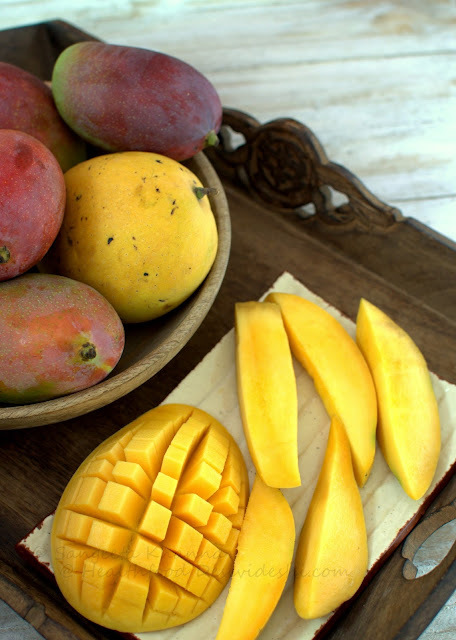 Make some before mangoes vanish this season. There is still some time for this delicious Thai style mango and coconut sticky rice. Fresh n healthy! nice combination! This is so fresh looking and I bet it tastes sooooo good -YUM! thanks everybody for liking the mango dessert. @ yasmeen it can be made with other fruits too, i have tried it successfully with plums , bananas and fresh dates. @SJ i remebered it is thai but wasn't sure , thanks for reminding me , i dint feel it's too heavy as the rice gets overcooked n light but yes as rice is a staple food with us it can replace a meal...we do it like that. @ thanks Grampa for visiting. coconut and mango...delicious combination with rice ! Your blog is interesting!! I had never heard of the combination of mango with rice. Yes i sometimes eat mango with chapati, that also tastes yum..
What a quick and simple recipe! 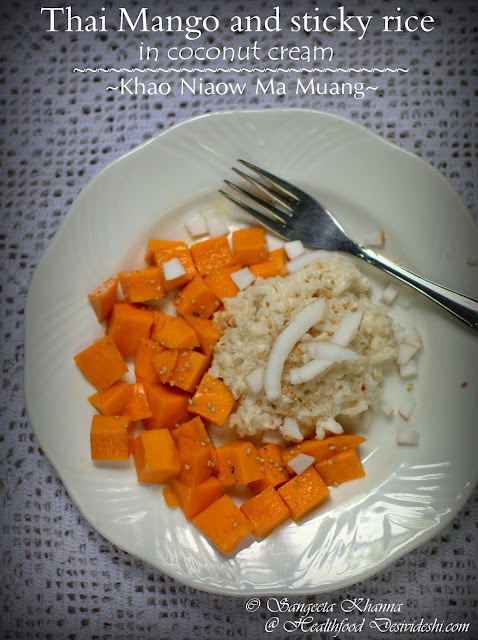 I'm going to Thailand this fall and I can't wait to try Mango Sticky Rice. I'm glad to know how to make it for myself.